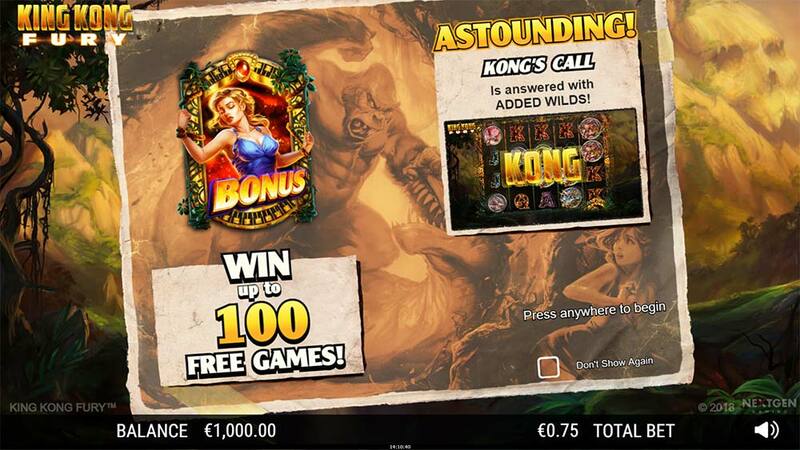 King Kong Fury the Latest Blockbuster Smash Release Slot Machine From Nextgen? 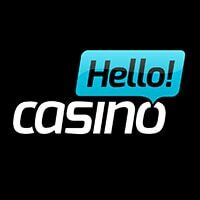 Casumo Casino has recently added the King Kong Fury slot, hailed as a blockbuster release from Nextgen Gaming to their casino. As a player, you get to travel to the infamous Skull Island where Kong is battling a variety of monstrous beasts such as Giant Dinosaurs, Snakes and Insects. All of this classic action has been encapsulated into a 5×4 reel 50 payline slot machine that is playable from just 25 credits and boasts a number of interesting special features that include Lightning Reels, Kong’s Call, Raging Re-Spins and a free spins bonus round which can award up to 100 free spins and re-trigger too! 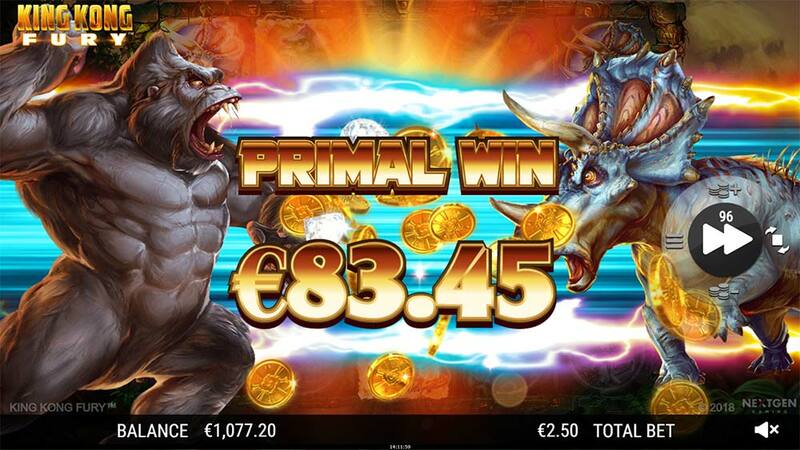 Base game features such as Lightning Reels can occur at random during the base game adding up to 15 matching higher paying symbols to the reels helping to create winning combination, Kong’s Call adds up 12 wild symbols and Raging Re-Spins grants a full re-spin of the reels when a full reel of wilds lands in view during the free games feature. With lots of action in both the base game and bonus round the action is thick and fast with the possibility of some decent wins too, you can check out all of these special features in the King Kong gameplay video below. 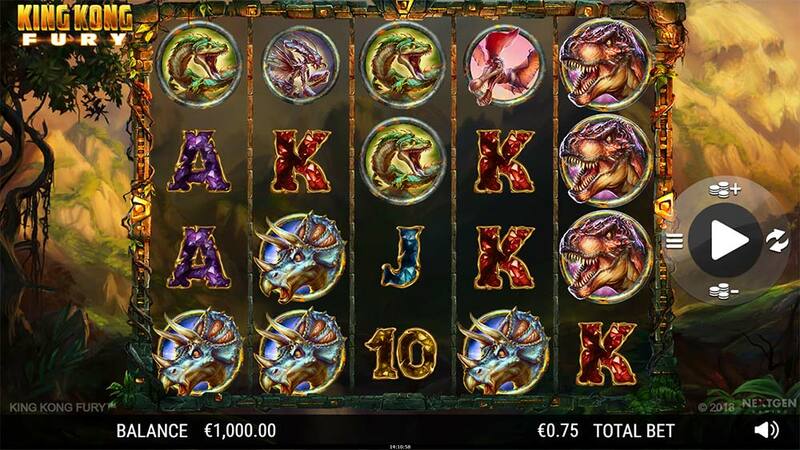 Lightning Reel – Can occur during any spin where a high paying beast symbol is chosen and then up to 15 of them are added the reels. Kong’s Call – Natives may chant for Kong with up to 12 Wild symbols being added to the centre reels. 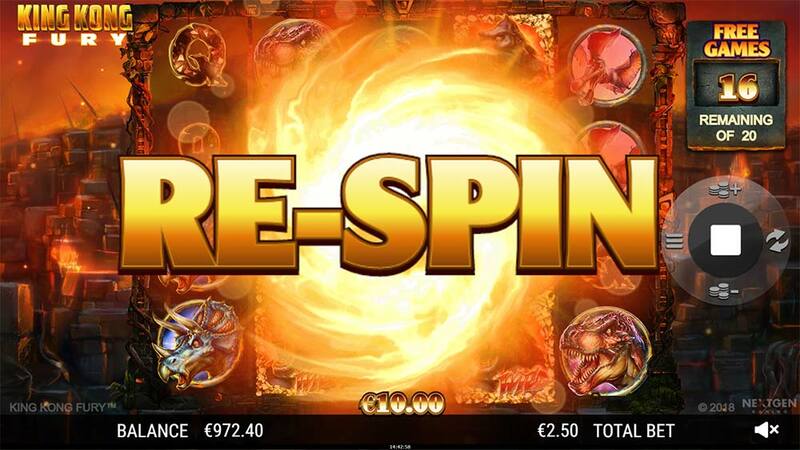 Raging Re-Spins – Occurs during the Free Spins round adding a Wild Stack to a reel and granting a Re-Spin, Wild Stacks remain held whilst Reels are Re-Spun with additional full Wild Stacks awarding an extra re-spin. 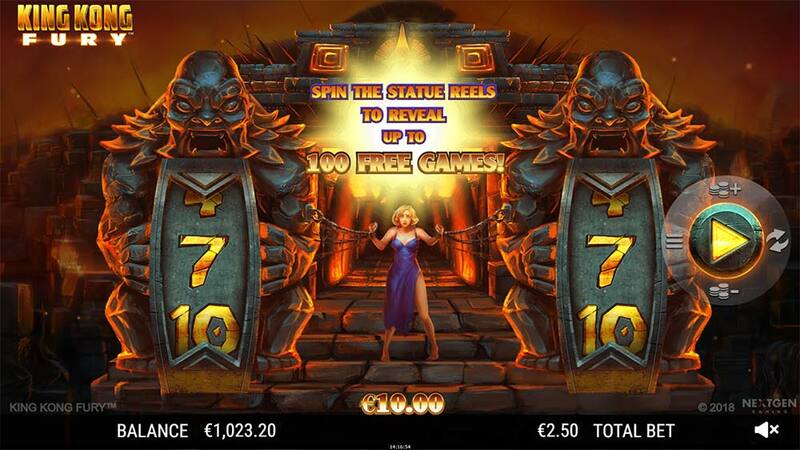 The Free Spins bonus round is triggered by landing the special scatter symbols on reels 1 and 5, from here you sacrifice Anne to the Mighty Kong with the opportunity of winning up to 100 free spins as the numbers on the statue poles are multiplied together. During the free spins, the special features listed above can also trigger along with re-triggers of the bonus round too. 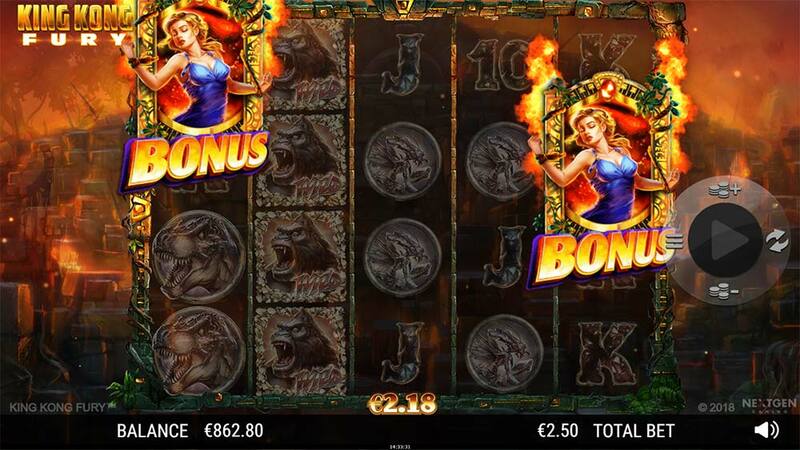 King Kong Fury is a very well-polished slot release from Nextgen boasting a great selection of random bonus features and some decent win potential too given the staggering number of free spins and re-triggers on offer. Whilst the overall max coin pays for the symbols are quite low when you factor in the special features, free spins and re-triggers the bonus round should be capable of producing some very nice wins. In our playtests, we had bonus rounds in the range of 20x stake up to 100x stake which was from bonus rounds with less than 40 spins awarded so plenty more potential. Overall this slot machine is Nextgen’s most polished slot release of 2018 and well worth checking out.